It was 1916 when Tristan Tzara declared Dadaism in Zurich. While this town has been influenced by major events in art history later on, it has been established as one of the important bases of the world’s contemporary art. As a matter of fact, there are surprisingly only a few museums that specialize in contemporary art in Europe, but Migros Museum of Contemporary Art is well known as an existence that always collects and exhibits unique and high-quality artworks along with Le Palais de Tokyo in Paris and Whitechapel Art Gallery in London, in the world’s art scene. The museum opened in 1996. Around this time, from the mid 1990s up to the present time, there has been a tendency that lot of artists gathered together in this town from all over the world. Migros Museum of Contemporary Art is located inside the building that was remodeled exactly like a former old Swiss brewery with the familiar brand mark of a lion. Other world renowned galleries of contemporary art also co-exist in this space, such as Eva Presenhuber, Hauser & Wirth, Peter Kilchmann, Bob van Orsouw, as well as Kunsthalle Zürich. Migros Museum of Contemporary Art sometimes developes activities collaborating with these galleries. There are many galleries and quite a few creators focus on their creative works in this neighborhood called Löwenbrau-Area, and it is an area in Zurich where top-notch information is sent out. Migros Museum of Contemporary Art facilitates great environments for the art students in this area so that they can continue their creative activities in Zurich after graduation. Simultaneously, the museum intends to keep on creating the art history of contemporary art by close relationship with the artists around the world through a process of interaction among people. The museum is under the patronage of the largest Swiss retailer, Migros. It incorporates various industries under its umbrella such as supermarkets, department stores, schools and so on. Although the eventful and really challenging life of the founder, Gottlieb Duttweiler, is well known, it is worth noting genealogically that he himself collected avant-garde paintings. Anetta Mona Chisa and Lucia Tkácová Manifesto of Futurist Woman (Let’s Conclude) 2008 Single-channel videoprojection (color, sound) 11:13 min. At the moment, Migros Museum of Contemporary Art is holding a truly powerful exhibtion, as if the whole 20th century philosophy and ideas were restructured. 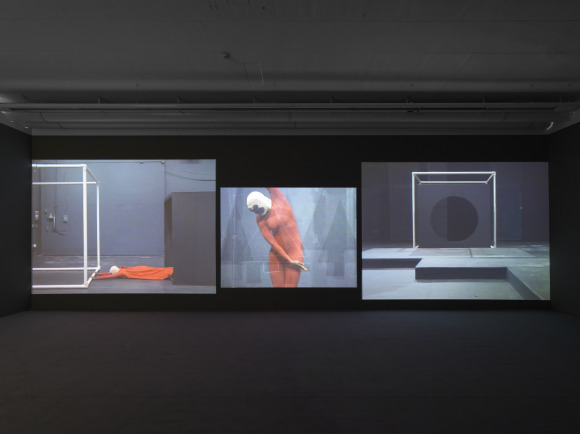 This group exhibition, “While bodies get mirrored- An Exhibition about Movement, Formalism and Space” brings 13 world’s renowned contemporary artists displaying totally different developments and various movements of contents, through the threads of symbolic vocabulary, such as dance, sculpture, video and installation. One focus of the exhibition is the influence of (post) modern dance and choreography in contemporary art. Another central theme is the re-presentation of the performative, and the notation of movement and dancerly activities through the most varied media. Early post modern dance and its postulation that “every movement is part of a dance and every person is a dancer” can be read on the one hand as an historical bridging moment to modernism, but also, on the other, as a moment that links the exhibited positions in this exhibition. In post modern dance, the legacy of formalist expression of movement has been applied and further developed, in a reaction to contemporary visual arts. In the last few years there has been an increased interest by younger artists in resuming and rediscovering this avant-garde movement of the early 20th century – the formal-aesthetic as well as the social perspective. I heard the interview with the curator, Raphael Gygax. Director, Heike Munder, has been successfully shown challenging events one after another since her appointment in 2001. 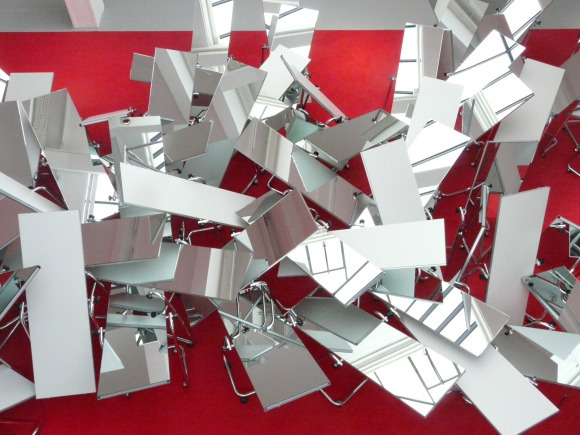 At the very back of the site, you will see “The Defenders Part2” by William Forsythe, where over 70 mirrors were wedged into one another like piles on a bright red carpet. Although through totally different manners, the language associated with this artwork corresponds, from work to work in the whole exhibition, to the “Get Mirroed” concept. Once you step in the venue, you will be welcomed by the work “The Swan Swoons in the Still of Swirl” by Mexican artist Mrtin Soto Climent, which has picked up the DNA of Forsythe and can be considered the implicaton of it. Steel sculpture and the author who makes it dance appear on the screen. By following this conductor wire, you will reach the dance by May Deran, an American avant-garde pioneer who reminds us of animism. Further ahead, there is a film by Delia Gonzalez, which extracts his imtimate female image based on the passage of the work by Henry Mirror. Wearing black wings of Oberon, the King of the Fairies from Shakespere’s Midsummer Nights Dream, a dancer who looks like appeared from the deep darkness, dances in a magical manner. Delia Gonzalez In Remembrance… 2010 Single-channel video projection (16mm film transferred to DVD, color, sound) 12:50 min. Let’s hear more of what Heike Munder says. While expanding the sculptural field, Julian Goethe tries to solidify the movement further by putting up an extensive rope. Anna Molska tries socio-political approaches. Hanna Schwarz Give 2010 Single-channel video on monitor (16mm film transferred to DVD, color, sound) 5:30 min. “While bodies get mirrored” is glowing with its root under the ground of “on going art prosess,” and it can be interpreted as the comprehensive group exhibition at present. I felt strange happiness that I myself felt the reflection in the Utopia presented in this exhibition.